It all started the day before our wedding anniversary looking back. Wednesday, May 12th, 2010. We had a new babysitter watching Nicholas and I only left for about an hour. When I switched with her while she was laying him down for a nap something just didn't feel right. I immediately had a bad feeling in my gut because he felt limp (lethargic) in my arms. I talked myself into thinking that I was over reacting and to just lay him down. I kept checking in on him. When he woke up, his head was slightly tilted to the right and I mentioned it to my husband and he said he didn't notice it. So I again just thought I was over reacting. The following day, Thursday, May 13th, 2010 Baby Nicholas' Auntie Kimmy was over watching him and when I came home she said, "Did you notice he's tilting his head?" It took less than 10 minutes from that sentence finishing to have him thrown in a car seat and sitting in the waiting room at our pediatricians office. My gut kept telling me something wasn't right and I was having a panic attack over it. The doctor told me that I was over reacting and then threw out in front of an intern, it's an onset of spasmodic torticollis and to give him motrin and warms baths and he probably slept on it wrong, much like a stiff neck and he would see us in a week. I felt like that answer wasn't good enough for me and immediately went home to what every crazed parent does and googled torticollis. I couldn't wait so 2 days later, Saturday, May 15th, 2010 I took him back in to see his pediatrician again. This wasn't the same doctor, this was the one we normally saw for him and I explained my concerns to her. She agreed with the other doctor and told me to give it some time and she would see us in 5 days. Once again, I left feeling like nothing was getting accomplished but wanting to trust them. I didn't wait 5 days again, I came back in on Monday, May 17th, 2010 and my doctors sent us for an X-ray. The X-ray results came back fine and our doctors said to come back in a week for a re-evaluation. My husband kept saying why aren't you happy with the X-ray results and I explained to him that it made no sense to do an X-ray for torticollis when torticollis is a muscular disease. I was thankful for the X-ray to come back fine, but in my heart I knew this wasn't over yet and there was a reason he was still tilting his head. So with each day going by and no improvement by Friday night, May 21st, 2010 we were getting ready to go out for the 3rd time since Nicholas was born. I took a shower and could hear Nick trying to feed the baby and he was screaming. Nick brought him upstairs and laid him on the bed. That same sense of panic filled my heart and I picked him up. He wasn't crying, he barely felt like he was breathing and was extremely lethargic, almost seizure like. I said we need to go NOW and Nick said he's fine, your over reacting. I was sick my stomach was in knots and I said something is wrong. Nick took him downstairs and went outside to sit in the porch area off our kitchen. I went upstairs and I only remember standing in front of the bathroom mirror and saying, "God, tell me what to do." while I walked in a circle. I walked downstairs and told Nick, I don't know why but we need to go to the hospital NOW, you just need to trust me. We packed and I called our pediatrician on the way and said tell me what hospital to go to because we aren't waiting anymore. We were directed to Beaumont ER. So after Blood results coming back fine in ER the ER doctor and radiologist were not in agreement to do a CAT scan - However, because I thought he may have had a seizure the Dr. Winters (our ER doc) ordered a CAT scan. Nick did not want this test done, he didn't like the idea of giving Nicholas drugs to sedate him for it, I told Nick - we are not leaving until we have answers. I was praying someone would tell me I was crazy and send us on our way. Some time in between 12:45am - and 1:20am on Saturday morning May, 22nd, 2010 our world stopped. Dr. Winters entered the room and he stumbled over his words when entering, asking who our pediatrician was. Nick and I looked at each other and knew something horrible was about to happen. The doctor pulled up a chair and said we need to talk, they found a mass in his brain. Nothing in the world could have prepared us for those words. Shock, fear, confusion and numbness were the only things I can remember feeling. He could barely answer questions because the mass was in his own words, caught by mistake because the CAT scan was only of the neck, not the head. He said never were they looking for something like this, he had no words to say other than the on call Pediatric Neurologist is on her way here right now for surgery. We were rushed into OR for a drain to be placed in his head, the symptoms he had all week were due to the hydrocephalus which is a build up of fluid inside the skull, leading to brain swelling and pressure from the tumor. They called this a life saving surgery. 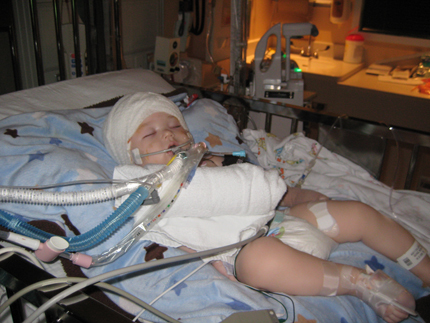 We were sent to the PICU while we awaited a surgery day and time. Our surgery was on Monday, May 24th 2010 and lasted six hours long. I was so exhausted I slept through most of the wait, I think my body just shut down to be honest. Our doctor, Dr. Holly Gilmer-Hill came out with a smile and said I believe I got it all! I hugged her and just cried. She said it was malignant and I believe it's Ependymoma. She said it looked like it, acted like it and more than likely that is what we would be dealing with. She said we would have to do chemo for a while. We left the OR waiting room relieved, knowing that God lead us to the right hospital and the right Neurosurgeon. The hands of Christ were administered through Dr. Gilmer that day and we will be forever grateful for the gift and talent God gave her. That night I asked the PICU resident to write down the proper spelling of the tumor. I still have the sticky note that said Ependymoma. That night I was already online understanding and learning what our future had in store for us. While we awaited the pathology report praying it was not malignant. My husband watched me go through breakdowns daily while I reached out to families whom have lost their battle to this disease and to surviving families. I had to read it all to know what the best treatments were for what our doctor believed we would be dealing with. When I learned there were different types of this disease and then also learning that the only treatment to be found curative for it is radiation - I was devastated. After 8 days of waiting pathology confirmed that our son's tumor was Anaplastic Ependymoma Grade 3. It was the most aggressive type of Ependymoma and we needed to make decisions quickly. That week I spoke to numerous parents of children that had been through this asking all my questions, crying with them and praying for the right path for our son. The first mother I reached out to had lost her child after a long 4 year battle to this disease. My heart sank and even though her heart was broken over this disease, she took the time to get me in contact with great families and support groups. Thank you Michelle Roderick! Along the way, she connected me to Mei Lai whom also was in a very painful place with her fight but still took the time to send out my info to braintrust.org where a handful of great parents reached out to me. It connected me with my friend Tamiko who didn't waste time sending me the protocol we are now on. When I read her email I remember crying and walking into our PICU room and saying to Nick, God's taking us to Memphis, were going to St. Jude. This was before I had even contacted anyone at St. Jude and wasn't sure if we met their criteria, God just told me we were going. Endless thank you's to those parents I spoke to from the PICU. I call those days the darkest days of my life and their support and guidance with their own stories I carried in my heart while we made our decisions. Thank you to Michelle Roderick, Pat Walker, Jill, Mei Lai Hippisley Coxe, Tamiko Toland and so many more for the time you spent speaking with me from PICU helping me find the son's treatment plan. Before Oncology from Beaumont had even came in to discuss our options, I told staff their to expedite getting our scans, slides, MRI's, X-rays and reports to St. Jude. When Oncology walked in the room to speak with us they said we are getting everything ready for St. Jude. and everything would be there within 48 hours. They said you never asked us what their opinion was, we told them it was open for discussion but that they wanted us to do 2 1/2 years of chemo, hoping to keep him from relapsing because they would not radiate him until he was 3 yrs of age. So we believe Michigan did not provide a life saving option for us and in order to get the newest radiation out there that is the least damaging, Memphis it was.